In 1890, Ralph went to the Royal College of Music, where he studied harmony and composition and had organ lessons from Sir Walter Parratt. He moved to Trinity College Cambridge in 1892. Attendance at Chapel was compulsory, and Ralph was sent for. “I did not see you in chapel this morning, Mr Vaughan Williams”. “No Sir”. “Perhaps, however, you were in the organ loft?” “Yes Sir, I was”. “Well, you can pray as well in the organ loft as in any other part of the chapel”. “Yes, Sir – but I didn’t”. This issue will naturally be a goldmine for organ buffs, yet it has been expertly devised to have a wider appeal. With one exception, most of the original works are non-vintage Vaughan Williams: he was a dab hand at small-scale organ preludes and occasional pieces, and a good selection of those is here. The exception is the Prelude and Fugue in C minor – composed for formidable master-organist Henry Ley, and easily impressive enough to stand alongside other classic works of its kind in the repertory. 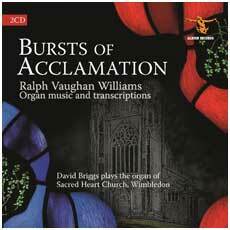 At least as interesting, meanwhile, are the various organ transcriptions of Vaughan Williams’s music by others. John Francis’s booklet note points out that the composer’s early years as working organist in London (at St Barnabas, South Lambeth) may well have coloured his mature orchestral style, with its long-sustained, widely spread chords and powerful sense of acoustic space. The transcriptions of the Sea Symphony andLondon Symphony slow movements (by Henry Ley) and the Tallis Fantasia (by Peter Beardsley) sound convincingly idiomatic in their way, and also beautiful. Briggs’s concern to avoid organ-dirge syndrome, admirable in itself, leads him to undercut some of the music’s space and grandeur at special moments: the great climax of Largo sostenuto from A Sea Symphony, or the Tallis Fantasia’s space-generating opening chords, surely pass by a little too swiftly. In every other respect his command and musicians are state-of-the-art. …Nominated Critics’ Choice by Gramophone reviewer Christopher Nickol as his CD OF THE YEAR. …The lion’s share of the transcriptions goes to Henry G Ley, Vaughan Williams’s professorial colleague at the RCM in London. The London Symphony‘s slow movement is beautifully moulded and although, initially, I had my doubts over A Sea Symphony sans Whitman, this also is highly effective. Fittingly, Ley’s own fineFantasia on Aberystwyth of 1928 is included. His concluding transcription of the ‘Antiphon’ (from Five Mystical Songs) provides the final Burst of Acclamation – ‘those loud triumphant chords’ concluding this triumph of musicianship.